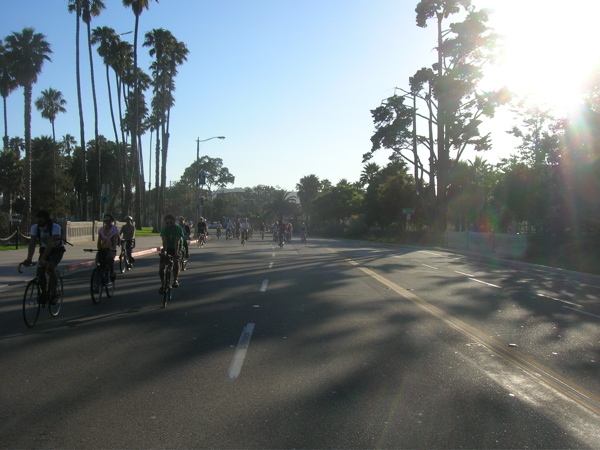 A large critical mass took to the streets of Santa Barbara to have fun, protest against the war in Iraq and take direct action against car culture. The crowd mostly obeyed the law but the police decided to make examples of several riders. According to the officers the riders were not obeying the California Motor Vehicle Code. Riders countered that the only safe way to ride when the streets are crowded with bicyclist is to take over the lane, or as much of it as necessary to avoid collision.